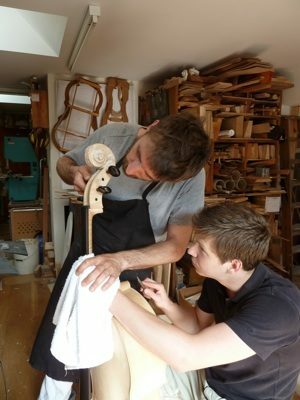 In the summer of 2013 Kai-Thomas Roth, a luthier specialising in cellos, invited three young makers from the Newark School of Violin Making to complete an unfinished cello which had been started by Brian Laurence, who sadly died in 2012. Roth and Laurence were fellow students at Newark in the 1980s, where Laurence had started making the instrument. 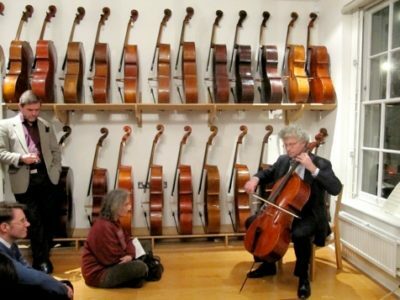 After his death Roth decided to complete his friend’s cello as a special project which would both provide a valuable learning experience for talented students and raise money for the RAB Trust. In July 2013 Roth and the students (Sam Brouwer, a first year from the Netherlands; Robert Stepp, a second year from Germany; and Benjamin Molinaro, a third year from France) worked intensively, sometimes up to 16 hours a day, in Roth’s Somerset workshop to finish the instrument in the white before Roth completed the varnish work. 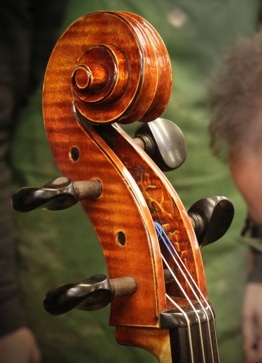 The finished cello was launched at a reception at Stringers, the London violin dealers, in February 2014. It was played by cellist Robert Max who is a member of the Barbican Piano Trio and teaches at the Junior Department of the Royal Academy of Music.